In this article, we’ll discuss about CopyOnWriteArraySet from the java.util.concurrent package. Iterators do not support the mutative remove operation. Traversal via iterators is fast and cannot encounter interference from other threads. Iterators rely on unchanging snapshots of the array at the time the iterators were constructed. CopyOnWriteArraySet() - Creates an empty set. CopyOnWriteArraySet(Collection<? extends E> c) - Creates a set containing all of the elements of the specified collection. boolean add(E e) - Adds the specified element to this set if it is not already present. boolean addAll(Collection<? extends E> c) - Adds all of the elements in the specified collection to this set if they're not already present. void clear() - Removes all of the elements from this set. void forEach(Consumer<? super E> action) - Performs the given action for each element of the Iterable until all elements have been processed or the action throws an exception. Iterator iterator() - Returns an iterator over the elements contained in this set in the order in which these elements were added. boolean remove(Object o) - Removes the specified element from this set if it is present. boolean removeAll(Collection<?> c) - Removes from this set all of its elements that are contained in the specified collection. boolean removeIf(Predicate<? super E> filter) - Removes all of the elements of this collection that satisfy the given predicate. boolean retainAll(Collection<?> c) - Retains only the elements in this set that are contained in the specified collection. int size() - Returns the number of elements in this set. Spliterator spliterator() - Returns a Spliterator over the elements in this set in the order in which these elements were added. 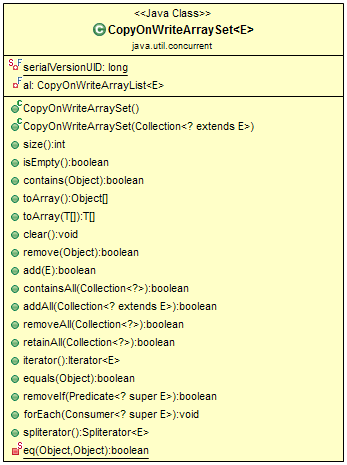 Object toArray() - Returns an array containing all of the elements in this set. One more example from JavaDoc: The following code sketch uses a copy-on-write set to maintain a set of Handler objects that perform some action upon state updates. It's important to know about iterators of this collection class doesn't support remove() operation, trying to remove an element while iterating will result in UnSupportedOperationException.